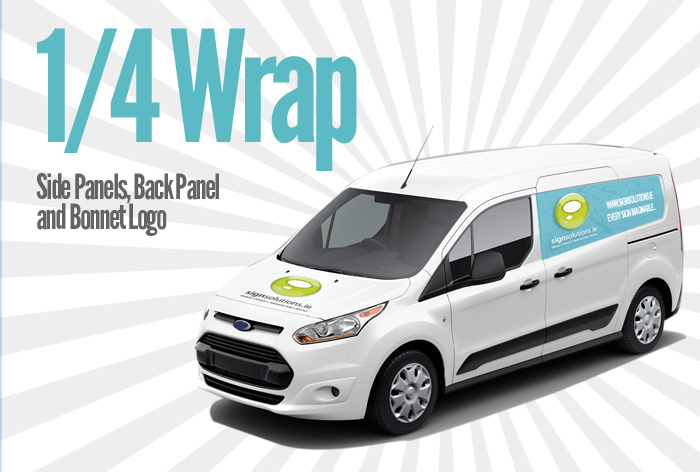 Vehicle wraps are high-impact, cost effective and they work for virtually any industry. The car wraps industry has matured over the past decade and Sign Solutions has risen to the top with its wrap expertise , experience and creative thinking and forward approach. We employ the industry’s leading installers who have been doing it longer than anyone. We employ the industry’s leading designers and installers who have been doing vehicle wraps for longer than anyone else. What is a Car or Vehicle Wrap? Anything less than a full wrap is normally called a “partial wrap”. 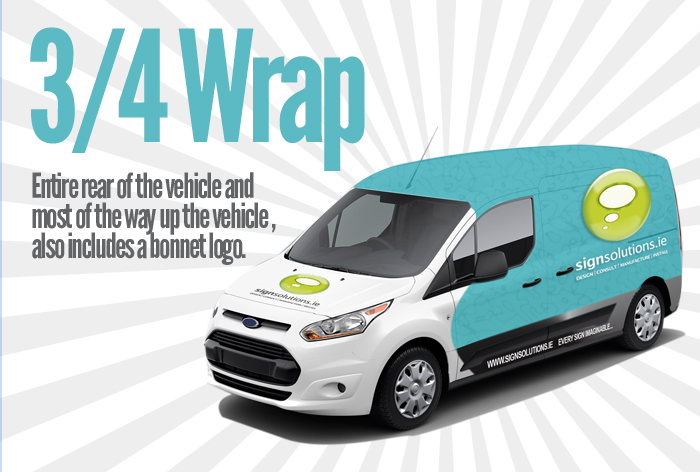 A half partial wrap normally includes the entire rear of the vehicle and halfway up the vehicle , and includes a bonnet logo. 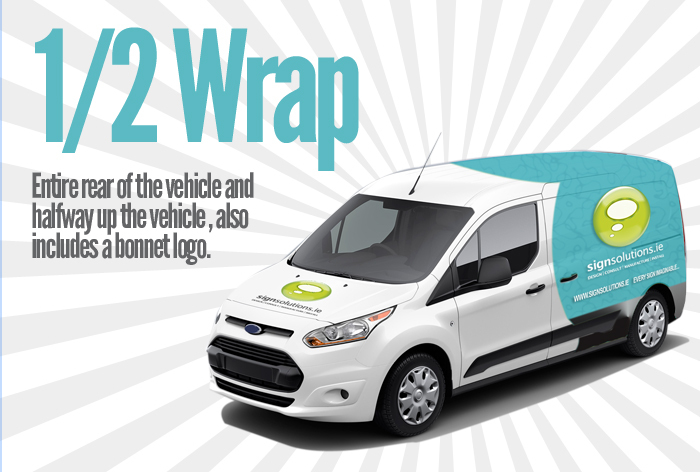 A three-quarters partial wrap normally includes the entire rear of the vehicle and most of the way up the vehicle, and include a bonnet logo. 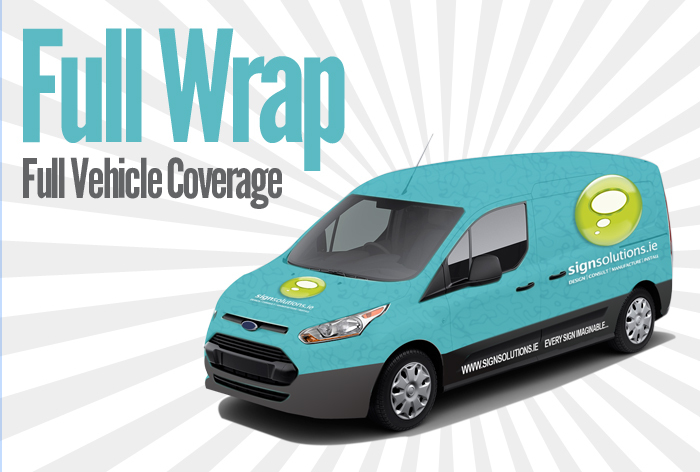 Typically, a full wrap includes the entire surface of the vehicle. If you are using your vehicle wrap as signage, there is no more cost-effective advertising method available. It has been proven that the cost per impression (CPI) of vehicle wraps is less than other forms of advertising such as billboards, television, radio and golden pages. If you are using your vehicle wrap to improve the appearance of your vehicle, digitally printed vehicle wraps simply cannot be duplicated by more traditional methods like paint or airbrushing. You can see through window graphics that are printed on contra vision window film. Contra Vision vinyl is perforated with very small holes that allow you to see out. From inside the vehicle, visibility is similar to regular window tint. From the outside, the graphic is visible. Full Wrap – Everything from a boat to a bus can be wrapped ! 3/4 Vehicle Wrap – One of the most effective methods to make your business stand out!